Was pruning through yahoo mail to clean out spam and such. Noticed copyright infringement notice from Time warner ( compared it to one on their site so seems legit ). Did not hit reply or anything. I already know about VPNs and what not. When do strikes expire, though? Looks like I'm on number 2 of 6 with month of seond one being june. Tried googling all kinds of different ways, but keep getting the youtube copyright strike system. How are you getting caught is the better question if you know about vpn's. Which country server are you connecting to just curious. All I'm saying is if you are going through a vpn correctly and then using torrent or DDL you should never be getting caught cause they cannot see what you are doing. I always use Netherlands for various reasons. Also, they should have shown you what you were caught downloading. Is Time Warner your ISP I take it? I would ask for proof first in a reply and tell them it is utter nonsense that you are not doing anything like that.. either A. they will tell you what you did specifically or ask them to or B. they will say it is not from us. Does the email ask for any correspondence..did you check the headers. Any signs it's a spam email phishing for personal info. Just some thoughts. Private Internet Access is cheap and super fast. They don't retain logs. Severs all over the world. Another option is a seedbox, which is what I prefer and use myself. I pay 5€/mo (~$5.80 USD) through Seedhost.eu and been with them for over a year. I prefer this route because my personal internet connection doesn't have to do any uploading and I don't have to route all my traffic through a VPN and worry that the VPN will disconnect and my real IP will be revealed to the swarm lists. For 5€ you get 150 gigs HDD and 1 TiB of traffic (only upload is counted against your data allotment). For 7€ everything doubles (300 gig / 2 TiB). Speed has never been an issue. The torrents download sometimes in excess of 50 MB/s. 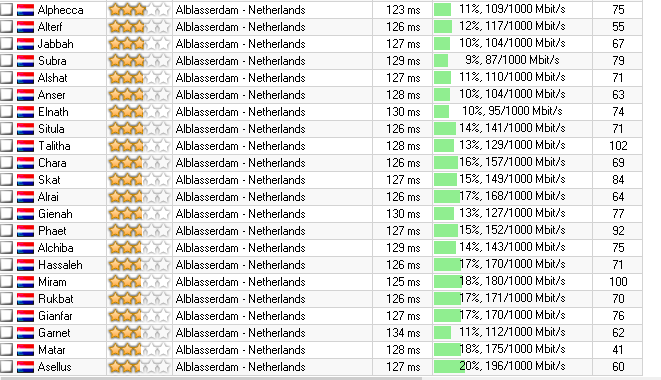 The Seedbox is in the Netherlands. I've never, ever, seen it down. They have ruTorrent, Deluge, and a few other clients you can install as well as a metric shitton of utilities such as Sickbeard, Couchpotato, Pydio, Headphones etc so you can fully automate everything from the torrenting via RSS to streaming it to your media center such as KODI. Another feature is you can install a Squid Proxy on your seedbox and proxy HTTP traffic through it but I never tried it.The file manager in ruTorrent works great for downloading to your PC but I use a DownloadThemAll! file manager to multi-select files via the direct HTTP file directory. You can also use sFTP and add accounts to it. I really like ruTorrent (the front end for rTorrent, which itself uses the Libtorrent backend) so I didn't install any other clients. Supports plugins, has a good built-in file manager, RSS, can set custom ratio rules and even create ratio rule scripts (i.e. torrents on certain trackers can seed longer), can send files directly to file sharing sites such as Depositfiles, and can customize the entire look of it down to fonts and colors. You can also stream the video from the client if you have the DivX webplayer installed. I really haven't used ruTorrent and the seedbox utilities to their full potential so I may have to play with them soon. Especially since I am going to go back to using KODI and try it with the Exodus extension. If you want KODI on your TV then: http://www.banggood.com/MX4-RK3229-...-Box-Android-Mini-PC-p-1042201.html?bid=22498 $28 for an Android 4.4 box with remote that plays 10 bit videos and Kodi installed. This post got too long: TL;DR seedbox and hook Kodi Android boxes on your TVs, bro.